Pasta has a million calories and nearly zero nutrition. I used to be sad about this. But then I learned how to make daikon noodles. As a pasta substitute, daikon is a super-appealing superfood. 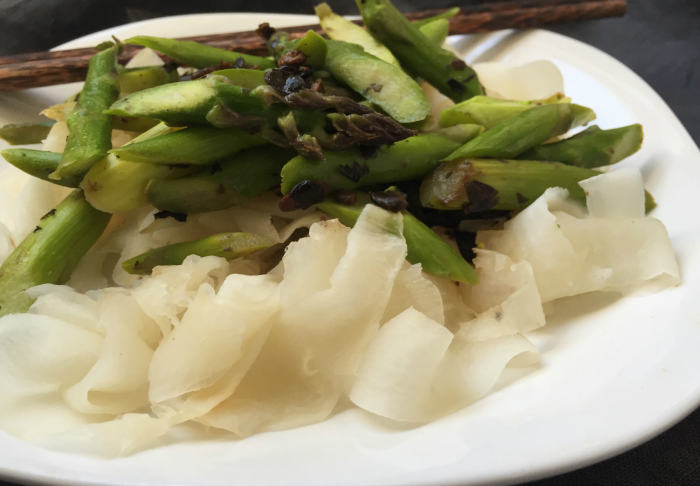 For an Asian touch, I like daikon broad noodles, with stir-fried asparagus and black bean sauce. Visually, they could pass for rice noodles — with a little imagination. Even though they lack the gluten-y elasticity of “real” noodles, that’s okay. I can eat them with guilt-free gusto in huge portions. When I add other ingredients, daikon is dressed for success to satisfy a hungry health-conscious person like me. As a pasta alternatives homemade daikon gives me a noodle that I can twirl on a fork and slurp with chopsticks. I’m very happy chowing down on daikon spaghetti with marinara sauce, olives and toasted pine nuts. The daikon radish is a humble, nutritious, root vegetable common in Asia. It’s packed with properties that can keep us slim, youthful and energetic. 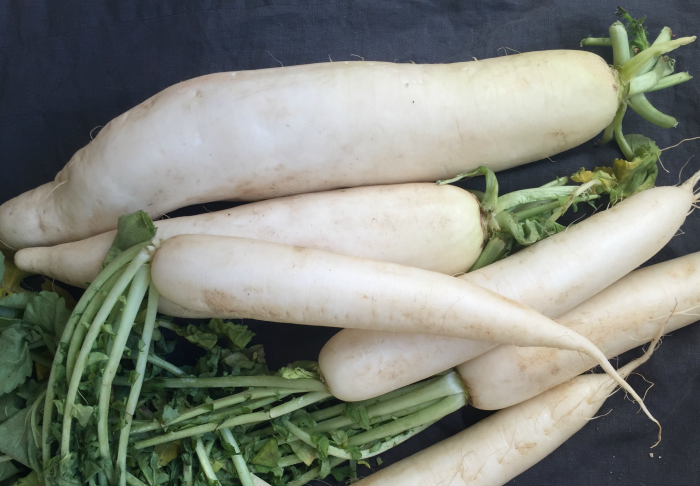 This long, white radish is also low in calories, inexpensive and versatile. Traditionally, daikon is already used in countless ways: chopped, diced, sliced, slivered, grated and shredded. Preparation methods include boiling, steaming, pickling, stir-frying and roasting. Raw daikon also works well in salads. Turning it into noodles is a new twist. Sure, they crunch a little, which never happens with “real” pasta made from flour. But I’ve gotten used to it, especially since veggie noodles are such a culinary craze. Once we cut it into white strands, daikon noodles look like white rice noodles. Add tomato sauce or brown sauce, they take on an appealing color that makes them a good spaghetti substitute, too. Cooking softens daikon’s radish-y bite. In this mild state, our new noodle option happily picks up the flavor of any seasonings. Making the noodles is a snap with the help of a spiralizer. This simple gadget transforms raw root veggies and squashes into long, spirals of spaghetti-like strands. If a spiralizer feels like too much to deal with, just use a simple vegetable peeler to make wide daikon ribbons. They work as noodles too. Unlike most fake pasta options, daikon is actually nutritious. And how about this bonus: daikon contains natural fat- and starch-busting enzymes. More good news: one cup of cooked daikon amounts to 40 calories, compared to 200 calories for a measly cup of “real” pasta. If you’re in Weight Watchers like me, daikon is even more appealing. It’s a zero-point veggie that I can eat freely all day long. Much better than one cup of “real” pasta, which eats up four points in my daily food budget of 30 points. Best of all, daikon is a celebration of beautifying, anti-aging, detoxifying properties, according to research studies. Regular pasta is a highly processed food that used to make me break out. I would feel gassy and bloated too. Prevention: Daikon contains anti-cancer compounds. Our immune systems also get a boost from its high concentration of Vitamin C.
Detox: Fiber-rich daikon keeps us regular as an aid to digestion and elimination. 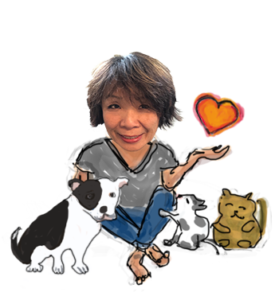 As a natural diuretic, it makes us pee, which helps clean out the kidneys. Anti-aging: Daikon is a rich source of bone-strengthening calcium. Because it acts as an anti-inflammatory, arthritis sufferers can find relief, too. My local Asian grocer carries daikon for 79 cents. Some of these long, white, tuberous roots are huge, weighing a couple pounds apiece. They’re sold loose and by the piece. So I have lots of choices. Places like Whole Foods carry young, smaller organic daikon for $1.49 per pound. While Whole Foods also sells pre-made, raw veggie noodles at $4.99 per 1-lb. box, I’ve never seen daikon for sale. It’s cheaper to make it ourselves, anyway. These days, you can find tons of spiralizers on the market. A friend of mine who is a chef likes the OXO model. I use the Inspiralizer. They each cost $39. She’s never tried mine and I’ve never tried hers but we’re both happy. So one of these might be an option for you. Cut the peeled chunks into 3″ to 4″ chunks, depending on the size of your spiralizing gadget. Make a big batch of raw noodles and save in a covered container. Stored in the fridge, they will keep several days. They will dry out a bit in storage. So add a little extra water while cooking, a spoonful at a time. Two cups of raw spiralized daikon will wilt down to barely 1-1/4 cups of cooked noodles. Use a saucepan or wok. Add a little oil over medium-high heat. When pan is hot, add noodles. Move them around constantly and gently. Cook for at least 5 minutes — or longer — until they wilt. Sample them while cooking. When they’ve lost their sharp, radish-y taste (unlike you like it! ), remove from flame. Serve any way you like. Drizzle with olive or sesame oil, add sauce or toppings, or toss them in a soup or salad. Cooking daikon noodles in a clean pan preserves their white color. If you cook the noodles in a pan you’ve already used to make your main dish or topping, the noodles will take on the dish’s color and flavor. Great tips. I’m doing WW too and really appreciate this noodle alternative. Jaime, first of all, thank you for the link! In working on this post, my poor old spiralizer blade got very dull. Don’t know if I can sharpen it. But if I can get the vegetti for 10 bucks at Target, woohoo! As for spaghetti squash, I debated mentioning it because my post is already so long. But thank you for bringing it up. I used to eat a lot of it because of it’s natural stringy quality. In comparing the two, I find the squash more work and less satisfying for a few reasons. 1) Baking it takes so long, maybe an hour? Whereas the daikon takes only a few minutes to spiralize and less than 5 more minutes to cook. 2) Spaghetti squash falls apart fairly easily and it can be quite wet. Daikon, feels more sturdy.